Welcome to Rebekah's room. 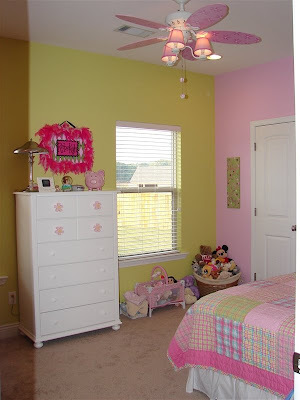 Her room is the most bright and colorful. 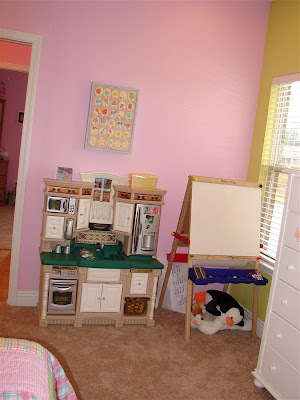 I wanted her room to be pink and green. The green we ended up with looks more yellow in her room. I think it has a lot to do with all the natural light that comes in her two windows. She likes it though and once we got her quilt on her bed, it really looked great. See the fan? I fell in love with these when I first saw them. We put the same fan/light in both of the girls bedrooms. What we didn't know when we installed these was how much light they put out. Or, better yet, how much light they did NOT put out. The lights take 40W bulbs and there are only three of them. Their rooms would have been really dim. So, at the last minute we opted to put four can lights in each of their rooms. Boy, what a difference that made! I love that we did it. It's nice and bright to play in and we can turn off the cans for a softer light. This the view as you come in through her bedroom door. Here is a shot of her bed. We purchased this bed after we moved into the new house. She loves her new BIG big girl bed. We chose to get a full size bed for her. It will make a nice bed for guests, should we need it. We found the metal flower on the wall at Hobby Lobby. It has all of the same colors in it as is in her quilt. I'm still shopping for something to go on the wall to the right of her bed. It needs to be something large, or several small prints that match. I'll know it when I see it! Here is a shot standing in front of her closet door. You can see her second window and her kitchen and art easel. The kitchen used to be Rachel's, but now Rebekah has it. Both girls still play with it a lot. That is the bathroom door there on the left. And now a shot standing in corner opposite the door. You can see her bedroom and bathroom door. 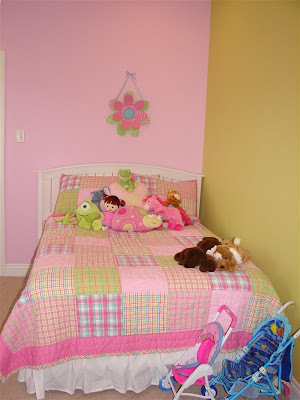 You can see also that she has two of her walls painted pink and the other two painted green (or yellow!). 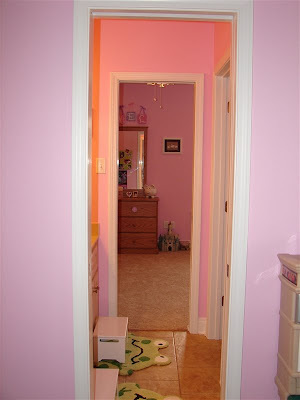 And last, here a view from her bedroom and into the bathroom. You can see on into Rachel's bedroom. Rebekah's closet is smaller than Rachel's. 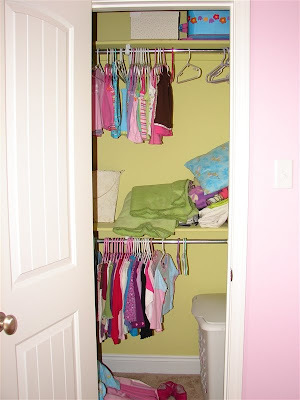 We didn't have the room for the shelves, like in Rachel's closet. For now, we have two rods that go all the way across. They put them in to where we can take out the lower one once her clothes get longer. And, I have two long shelves that go all the way across the length of her closet. 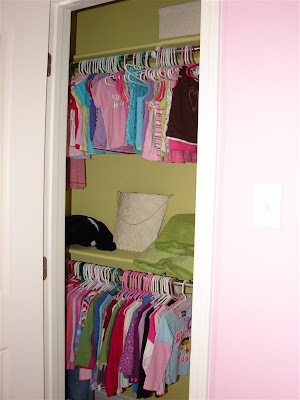 And here is one more view of her closet. You can see how it goes back. 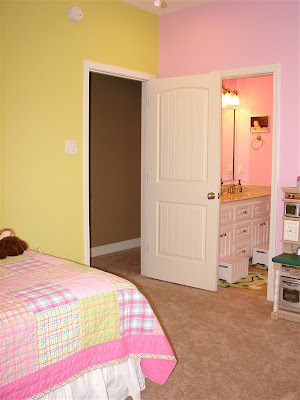 We painted the inside of her closet the same green (or yellow!). Wow! We're almost through with the whole house! Just a few more rooms left to show and we'll be done. I'm so glad you've come along for the tours. I've enjoyed showing it all off. See you tomorrow! Love it! Isn't it funny how the paint chip color and the real color don't always match up? Just swung by our house yesterday and saw the placements for all of our can lights. Wowie! I don't even want to look at my electric meter if they are all on at once!